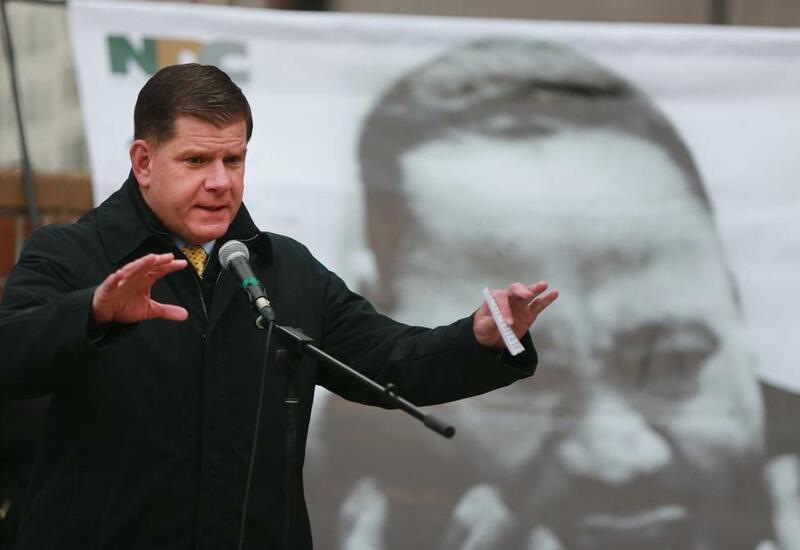 Boston Mayor Marty Walsh spoke at a ceremony honoring Martin Luther King Jr. in April. A world-class memorial planned to Martin Luther King Jr. and Coretta Scott King will include a monument on Boston Common, a high-tech immersion experience in Dudley Square, and a $1 million endowment for programming to be developed with Roxbury’s Twelfth Baptist Church, where King was an assistant minister in the early 1950s, according to details released in a statement by city officials Friday. “By expanding the reach of this memorial from Roxbury to the Boston Common, we are elevating the Kings’ living legacy for residents and visitors across Boston in a way that has never been done before,” said Mayor Martin J. Walsh said in the statement. The project, led by Walsh and a nonprofit called MLK Boston, intends to commemorate the Kings’ years in Boston, where they met, and was formulated after considering community feedback from 14 meetings in neighborhoods across the city, according to the statement. It will not only remember King’s time in Boston, where he earned a doctorate in systematic theology at Boston University, but also the legacy of his work around the world. Coretta Scott was studying opera at the New England Conservatory of Music when she met King in Boston. The memorial will honor her strong “faith in the power of art” and her battles on social issues including racism, sexism, and poverty, the statement said. Five finalists out of 126 artists who competed to contribute to the memorial were also announced in the statement. The final selection will be announced in November. Plans to create the memorial were announced in September. In December, project leaders invited the public to contribute to the memorial and opened up an international art contest, inviting artists and teams to submit their work for consideration. Each of the five art finalists announced Friday will receive a $10,000 stipend from MLK Boston to develop design proposals that will be available for public comment in September. The finalists are: Barbara Chase-Riboud with Michael Rosenfeld Gallery, David Adjaye and Adam Pendleton with FuturePace, Hank Willis Thomas and MASS Design Group, Wodiczko + Bonder and Maryann Thompson Architects, and Yinka Shonibare, who studied fine art in London and explores issues of race and class in his work. “We are humbled by the outpouring of interest in this project, as well as the quality of all of the artists’ submissions,” said Robin Powell Mandjes, executive director of MLK Boston.